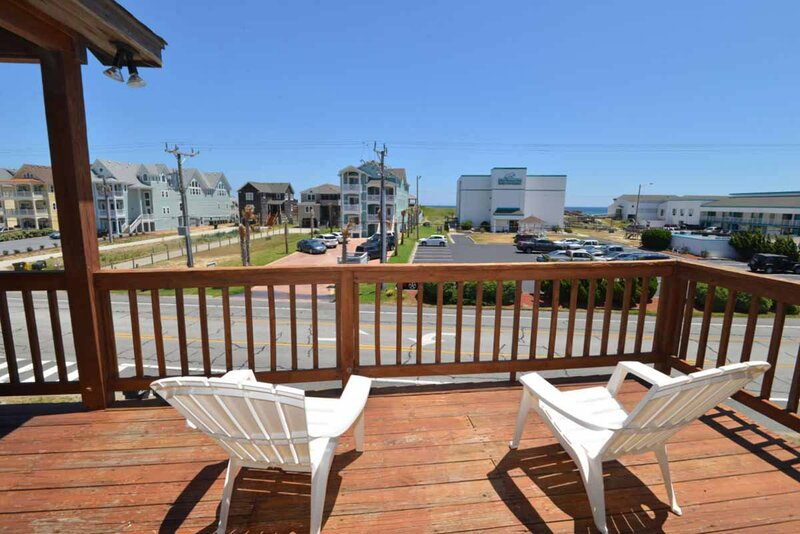 This attractive Kill Devil Hills vacation home offers a Semi-Oceanfront location w/ horizon ocean views & a short walk to the Beach (approx. 200 Ft. to Beach Access just Across Beach Road at Lake Drive). The bright & open floor plan offers cathedral ceilings & plenty of space to enjoy. There is a Hot Tub on the ground level that is perfect for relaxing. The entire family will enjoy this Outer Banks retreat. Ground Level: Parking for 4 Cars, Steps to Entry, Hot Tub, Enclosed Outside Shower, & Charcoal Grill. Mid Level: 4 Bedrooms (2 w/ Queen, Shared Bath w/ Shower Only,1 w/Queen, & 1 w/Duo Bunk & DVD), Full Hall Bath w/Laundry Area, & Covered Deck w/Furniture. Top Level: Nicely Decorated Living/Dining/Kitchen Area, Partial Ocean Views, TV, Half Bath, Covered Deck w/Picnic Table, & Sun Deck w/Furniture. Features include: C/AC & Heat, Washer/Dryer, Dishwasher, Microwave, Phone, 5 TVs, 2 VCRs, 2 DVD's, Stereo w/CD, Wireless Internet, 6 Ceiling Fans, & Deck Furniture. Two Mature Dogs Allowed w/Fees. This is a Non-Smoking Unit. We loved this house it was so cozy and loved that it had an ocean view just beautiful! Beautiful home! Loved the close proximity to the beach! We have stayed in Fish-N-Time several times. We love this house! This is a GREAT house for a family to enjoy at the beach. Excellent location and the hot tub is fabulous. Spacious living/dining/kitchen for creating lovely family times and memories. Very nice hot tub and enjoyed the keyless entry. Very nice home and great location. We enjoyed our visit! This is an exceptionally nice home with a convenient location.